What kinds of lighting are you living with? The following 2 animated videos feature a lemur, named Wao, who wants to learn about lighting for his home and a very well-informed tapir called Baku, who teaches Wao about "Symphony Lighting," in other words basics about LED lighting, and the importance of lighting design. The light at Wao's home goes out very often. So Baku advises him to change his lights to LEDs. LEDs are more energy efficient and last longer than incandescent and fluorescent lights. What's more, they are compact, and do not emit as much heat or UV/infrared rays, so they may be used for a wide range of applications, and they can also easily adjust color tones and brightness. Baku explains in a very straightforward, clear manner the various advantages of LED lighting, which is not only being used in people's homes, but also in other facilities such as shops and buildings. To create a comfortable environment, rather than making the entire room evenly bright, it is better to vary the brightness by placing lights near the sofa or on the table, or near your favorite things. For example, if you place a light by the table, people will naturally congregate around it, and if you light up the wall in a corner, you can give the space a sense of depth. 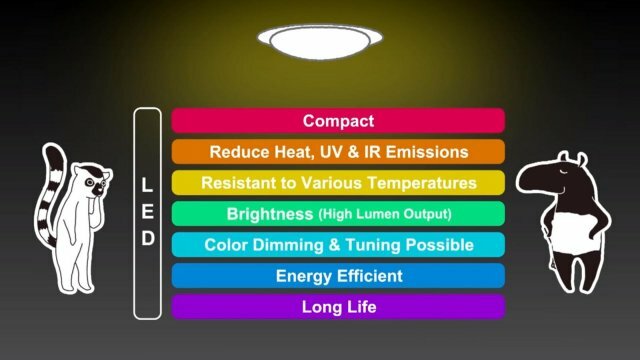 The concept of Panasonic's "Symphony Lighting" is about having the right combination of lighting fixtures and the right amount of light in the places you want light. Moreover, when you want to relax, you can light your favorite spot with relaxing lighting, and when you entertain guests, you can have hospitable lighting that lights up the table and walls. So with a different combination of lights, you can create an atmosphere that perfectly fits the situation. By cleverly selecting energy saving lighting fixtures, you can even bring down your electricity bill while using multiple lighting. And if you are not sure what kind of lighting would work best for your home, you can go to Panasonic showrooms and shops to talk to professionals. So what did you think? Panasonic will continue to deliver high quality, safe and reassuring lighting equipment to make people's lives even more comfortable.